Sometimes conspiracy theories can be a fun diversion, and at other times some can be hysterically funny! Which conspiracy theory do you find interesting and why? New World Order---shadowy groups seek to rule the entire planet, or they already do. Possible involvement of such groups as Freemasons, the Trilateral Commission, and the Rothchild family of Europe. JFK assasination--my personal favorite. JFK wasn't killed by Lee Harvey Oswald. He was killed by such groups as the CIA, the mafia or possibly Cuba. Some watchers of this one think LBJ might have orchestrated it. Some theories even say the driver did it!! UFO coverup---alien spacecraft have landed on earth many times and continue to do so, as governments around the world try their best to suppress information about it. Starting at Roswell in the 1940s and continuing today, governments are denying alien craft are here. There are a multitude of conspiracy theories to ponder. Thoughts? I'm really interested in the UFO conspiracy. The thing that really changed my opinion was seeing the NASA Videos of UFO's. It's really quite fascinating to see. I'm somewhat interested in all of them. I am firm believer that what we are told and what really happens is seldom in sync. Think there is pretty solid evidence the JFK assassination did not happen as the Government (and history books) say it did. I'm wondering when all the material relating to it become unsealed, as most of the interested parties are dead, so shouldn't be long. There are a handful of UFO "incidents" (since not all are sightings) that can not be disputed, disproved, etc. I remember two, one was of radar catching an object enter our atmosphere, which is the outer range of the radar system, and almost as if it were aware it was detected, reverse and pull back out into space. Mundane celestial objects are not capable of such a motion due to basic laws of physics. The other was picked up by the British royal airforce of a ring of radioactive elements (don't remember the details and I am butchering them) in the woods that do not exist naturally on earth and cannot be created by current technology. They investigated the site because local nieghbors reported seeing something, and of course this was accompanied by physical signs that something had landed. well, it's stories like this that fuel conspiracy theories... mainly because of the horrific reporting on an event witnessed by many including pilots, mechanics, and travelers @ o' hare airport. the link that i am posting is actually one of the better news outlet articles that exsists and it is still terrible. there are hardly any accounts given although many credible voices spoke up.... but, in all the articles i've seen they focus mainly on some guy who didn't see anything that works in the air-traffic tower... the only thing he had to offer towards this story was a silly little one-liner joke. this happened on election day of 2006, and if you research you can find some other information including an interview with an airplane mechanic @ o'hare. i try to be careful with weeding through information about events like this. i'm skeptical of the news media/government and i'm skeptical of the ufo zealots. ^ The thing I find odd about the story you mention is the attempt to suppress it, it only coming out after a Freedom of Information Act challenge. It would serve better to discredit this kind of thing by ignoring it but the US government consistently tries to suppress these things, which only gives the UFO theories more credibility. I do not know if UFO's visit this planet, I suspect they may have at some point in our ancient history, but from what little I pay attention to this subject, it seems the scant evidence that this does happen comes from foreign governments/bodies, like British sources and I think Brazilian (I'm in the realm of memory here, if seriously challenged I will look up some references). 1968 was a bad year for subs. We lost the Scorpion, the Soviets lost a Golf off of Hawaii (it was suggested in Red Star Rogue that it was destryed while trying to carry out a nuclear attack on Pearl Harbor), the French lost two subs and the Israelis lost the Dakar. Regarding the Scorpion and the Golf, a buddy of mine who was in the Navy in the late seventies and early eighties said the prevailing rumor at that wime was they got one and we got one. A UFO "disc" was spotted hovering above Chicago O'Hare by airport workers and even pilots. The FAA just dismissed it as weather condition which is a very common explaination. Its apparent that there is some truth to UFOs. The questions to ask: Are they extraterrestrial? or is it super advance anti-gravity technology that our government is testing. They say the top secret technology isnt made public until after about 30 or 40 years. Stealth technology was released to the public in the 1990s but it was being worked on in the 1950s and 60s. So just imagine the new technologies our government is working on today that wont be revealed until 2037 or 2047. Another interesting cover-up theory is about the Great Pyramids and the Sphinx. The conspiracy is that Egyptian government officials are covering up information that explains the orgins of man, Atlantis and how and when the Pyramids and Spinx were built. There is a vested interest in keeping history just the way it is instead of rewriting it. alot of peoples reputations are on the line. I think a lot of the conspiracy theories are fun to read up on and watch on TV. I particularly like the UFO ones. Most of the UFO stuff out there is easily explainable or a flat out hoax. There are a few cases that are really hard to discount though. One that comes to mind occurred on the Illinois side of St. Louis. Five police officers from different communities and one private citizen spread over the area witnessed and tracked a triangular shaped object make a semi circular arc over the suburbs east of St. Louis in the early morning hours, sometime in 2000. There is an Air Force base in the area, but why would the government test top secret aircraft over heavily populated areas? Why is it that we can never get a decent photo or video of this stuff in this day and age? I also believe there is a very good chance the US govt shot down flight 93. And I wouldn't blame them for doing it given the circumstances. However, the people that claim the govt blew up the WTC and the Pentagon need to get a grip on reality. A couple more that need to go away are the moon landing hoax and crop circles. Both have been discredited repeatedly and only the true loonies believe those anymore. Yet, they still get airtime on TV. This looks like a fun thread. Along the lines of the Freemasons and such, I hear that there is a Skull and Bones Conspiracy. Too many Government leaders on both sides belong to the same secret society. Additionally many civic and corporate leaders are expected to also belong. There is also a cover-up story about "The Ica Stones" found in Peru I think. 11,000 ancient stones with picture carvings were found in a cave by a farmer. The carvings depicted men fighting dinosaurs which suggest that man and dinosaurs lived side by side. Current history says that dinosaurs lived in a different time period than man. Other carvings shows astronomy and what appears to be a man looking through a telescope. other carvings show advanced medical practices (heart surgery, brain surgery and DNA experiments). Some are trying to say its a hoax but there is no way that farmer could have carved all those stone. The farmer was decribed as unintellegent and many of the carvings depicted animals and fish that have been extinct for thousands of years. The government of Peru tried to threaten and arrest the farmer. 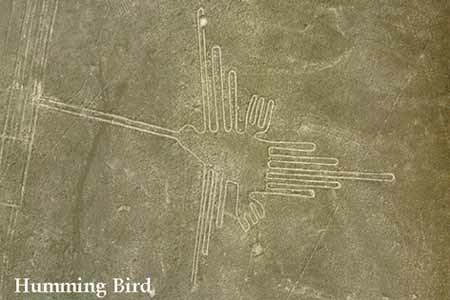 The stones were found not too far away from the Nazca Lines which is another mystery that is stumping scientist. 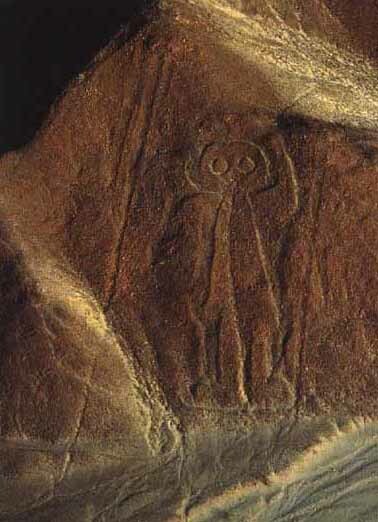 btw here is a picture of part of the Nazca Lines which are rocks arranged on the ground to create pictures. The mystery is how could these ancient people have created these picture lines on such scale without being about to fly? many of these pictures are like 20 miles wide!! Some of the lines didnt form pictures at all but what appears to be "landing strips"
The "Spaceman" created on the side of a mountain. The Nazca people for some reason tried to warp their heads. Some say they did it to look like extraterestrials. There is also a cover-up story about "The Ica Stones" found in South America I think. 11,000 ancient stones with picture carvings were found in a cave by a farmer. The carvings depicted men fighting dinosaurs which suggest that man and dinosaurs lived side by side. Current history says that dinosaurs lived in a different time period than man. Other carvings shows astronomy and what appears to be a man looking through a telescope. other carvings show advanced medical practices (heart surgery, brain surgery and DNA experiments). Some are trying to say its a hoax but there is no way that farmer could have carved all those stone. The farmer was decribed as unintellegent and many of the carvings depicted animals and fish that have been extinct for thousands of years. There are a lot of mysteries surrounding the Nazcan civilization. They layed out huge drawings (hundreds of meters in scale) in the desert. Why would they do that? They can't be seen except from the air and weren't even discovered until the advent of aircraft. I've never heard of what you are talking of with the carvings, I'll have to check it out. Another explanation for the dinosaur carvings is that they unearthed fossils, which definitely could have led to myths in their culture concerning battles between men and dinosaurs. Richard Hoaglund has a book about the face on Mars and he claims there is remains of cities there as well. He had a video tape called the Moon-Mars Connection that said there were similar structures on the Moon. I've heard the reason we haven't had manned space flights leave Earth's orbit since 1972 is because we found something on the moon that shows humans or aliens had a base there. The powers that be were afraid this information would get out to the public. I think it is much more likely that funding got cut. There is also the theory that we never went to the moon in the first place and that everything was fillmed in the Nevada Desert. The video footage was poor and this was during a time when video technolgy was more advanced. The flag was waving in space. there is no wind in space. That could expalin why we havnt gone back to the moon since. The funding DID get cut, but why so quickly? Did you know that one complete Apollo (LM and CM)/Saturn unit was built up, but sent to a landfill? They must have achieved flight, even if they used some form of hot air ballons. I think human history could go back much further than anyone can imagine. Scientist say that planets evolve in cycles that repeat thousands and millions of years. It makes you wonder how many times humans or human like figures have evolved and reevolved on earth. After a certain period of time the planet is destroyed by some catastrophy such as an astroid and all evidence of what existed before is gone. What if men walked the earth a million years ago and their technology was just as advanced as ours today. But then some catastrophy happened and wiped out all life. Over the course of time the planet evolves and then dinosaurs begin to walk the earth. Then dinasaurs are wiped out and man evolves again. We just dont know how many cycles earth has gone through. we dont even know how old the earth is. Scientist speculate that its millions and millions of years. Apollo 11 landed on the moon in July 1969 after almost a decade of heavy investment. Apollo 17 was the last landing in Dec 1972. After we "won" the space race, public interest waned greatly in the moon landings. It was hard to justify spending untold billions on an extremely expensive program while we were mired in a unpopular war in Vietnam. Also, NASA's new objective shifted from moon landings to space habitation programs such the Skylab and the Shuttle. Every one of these moon landing hoax theories have been debunked. I've seen the video you speak of, the flag is only waving while the astronaut has his hand on the pole. After he lets go, it slowly stops flapping and becomes still, as you would expect given there was no dampening effects of air. This website does a nice job of discrediting the moon hoax theories, as well as explaining other astronomical misconceptions. I have read his book as well. Scientists pretty much agree across the board that the earth is 4.5-4.6 billion years old based upon radioisotope dating techniques. I don't know about you guys, but I find it highly suspicious that there is a gas leak in NYC, a C-4 bomb found in the Port of Miami, and a major chemical spill occurring in the Houston area. All of these things occured today. I question is what was the earth like between its birth and the birth of modern man which was somewhere around 10,500 bc? Did man exist in another time period 10 million years ago? 100 million years ago. Its facinating to think about the possibilties. The historical development of man may be repeating itself in cycles. when we become exstinct (its just a matter of when) The earth will start all over again and maybe something simliar to dinosaurs will walk the earth again. I've never heard of that theory. There is nothing that I know of in science, such as fossil records, that back up that concept. Don't forget 10 blocks in Austin closed off because they found 60 dead birds. Could be testing dispersal patterns.